Confused about the difference between deodorant and antiperspirants? We spoke to Indigenous Beauty founder Catherine Acevedo about deodorants vs antiperspirants and why natural is best. Sweating is a natural biological function that plays several keys roles. It cools us down to prevent overheating and helps your body to eject toxins. This supports a healthy immune system and stops us becoming unwell from diseases associated with toxin build up. Sweat glands are also affected by your hormones, meaning that stressful or embarrassing situations can cause us to sweat. Did you know that sweat itself is odourless? However once it comes into contact with bacteria on your skin it will begin to smell. Many perfumed body washes and soaps can alter the delicare pH balance of our skin, allowing bad bacteria to thrive (for more on probiotic skincare, click here). Therefore, we recommend using a gentle pH balanced soap can help to fight bad underarm odour by returning your skin to its natural pH. We spoke to Indigenous Beauty Founder and natural deodorant expert Catherine Acevedo to find out more about underarm hygiene. 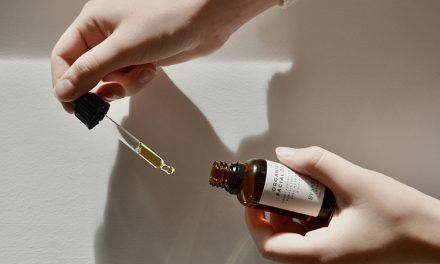 Former Beauty Industry insider Catherine became disillusioned with all the synthetic ingredients in her beauty products so started making her own. 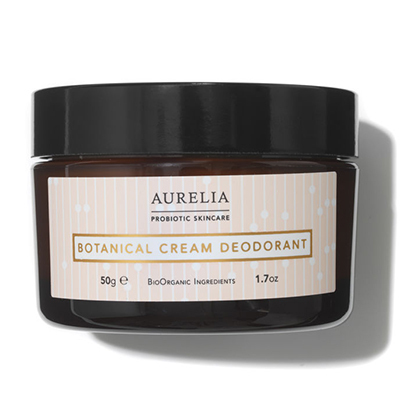 Her deodorants have been rigorously tested and don’t contain aluminium, parabens or irritating fragrances. 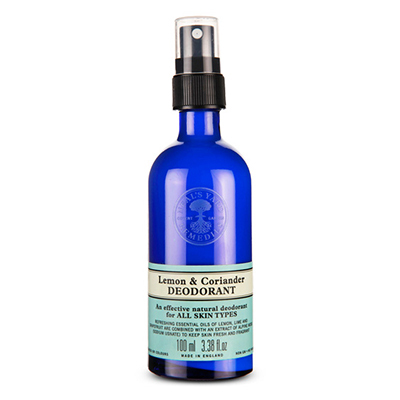 ‘Antiperspirants fight against the vital and natural biological process of sweating. Sweat glands exist to regulate our body’s temperature’ says Catherine. Designed to stop you from physically sweating, antiperspirants contain aluminium. The aluminium acts as temporary plugs on your underarm sweat glands. In doing so it prevents a natural bodily function. So the FDA (US Food and Drug Administration) classes aluminium containing antiperspirants as a drug not a cosmetic. Over the years several links have been drawn between cancer – specifically breast cancer – and the use of antiperspirants. This is because the aluminium and parabens in traditional products when left on the skin near the breast could be absorbed into the breast tissue. However, no clinical studies have found conclusive evidence that use of antiperspirants specifically causes breast cancer. ‘The purpose of a deodorant is not to prevent you from sweating, but to prevent any bad odour,’ Catherine tells us. Good deodorants not only smell pleasant but also contain antibacterial and antimicrobial properties. They work to eliminate bad bacteria on your skin, meaning you will still sweat, it just won’t smell bad. In many synthetic deodorants, alcohol is used as an antibacterial agent, however as many of us will atest, shaving your underarms then adding an alcohol based product doesn’t always make for happy pits! Instead look for more natural brands that contain coconut oil or baking soda to fight bacteria. There are lots of great, effective options on the market. From handy sprays to soothing cream formulas. 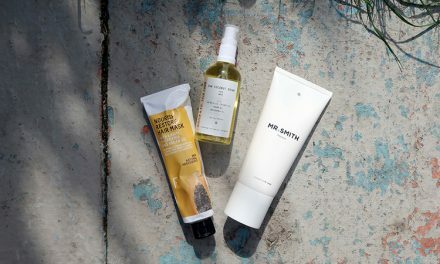 When switching from a synthetic antiperspirant or deodorant to a natural one, allow a few days for your body to get used to the natural ingredients before you see results. Perfect if you’re in a rush, simply spritz and go. The zesty combination of Coriander and Lemon feels refreshing but also naturally cleanses bacteria. Applying a cream to powder consistency with your fingers feels a bit weird, but it dries quickly and you don’t need much. Kaolin clay absorbs moisture while shea butter soothes and nourishes dry underarms. 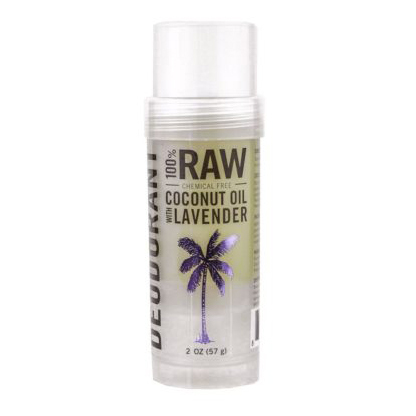 Containing antimicrobial coconut oil and baking soda to eliminate odour, this stick deodorant is highly softening. The lavender scent means your pits smell delicious too. Applying a cream to your underarm is at first odd, but this creamy formula dries quickly, leaving your pits smelling fresh and soothed. It’s very gentle, we love to use this post shaving. We recommend this one for those of us who need a more high powered deodorant. Magnesium and clay absorb moisture while also being antibacterial. 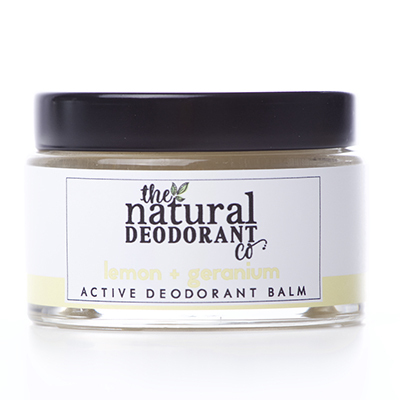 The refreshing lemon and geranium scent will keep you smelling fresh. Disclaimer: The content of this article is for general advice only and should not be used as a substitute for professional healthcare or beauty advice. We make every effort to ensure we only recommend safe products however you should always do a patch test when trying new products. 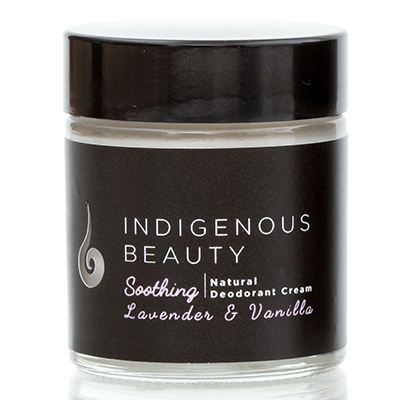 Indigenous Beauty provided us with a free sample deodorant to test in order to substantiate their claims. We enjoyed using it so have featured it here.